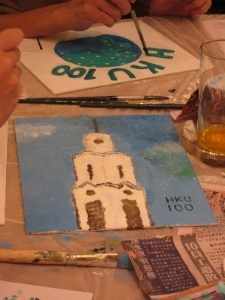 Hong Kong University Alumni Association (HKUAA) Green and Culture Group has organised two free-style painting sessions at the HKUAA Clubhouse, with the aim to honour HKU’s 100th anniversary and foster a greater bond among HKU’s current and past students. 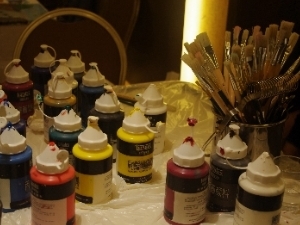 The painting sessions received enthusiastic responses and were participated by alumni and students from different generations. 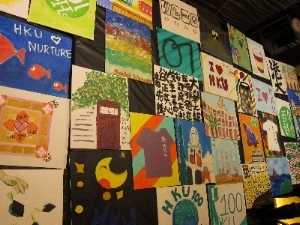 The participants painted their fondest memories of HKU. HKUAA would like to take this opportunity to thank everyone who has shown support to the events. 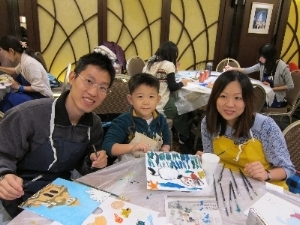 The fun and sharing did not end with the painting sessions, as more than 100 artworks have been collected from the events and turned into a banner in the form of a montage as a gift to HKU. The banner was displayed at the Centenary Gala Dinner on December 18, 2011. The paintings are displayed at the HKU Global Lounge in February and March 2012, and now are being displayed at HKUAA Clubhouse from May to August, 2012. We all love HKU! Do you share this piece of HKU memory too?